Add Meta Tags in your blog/website, they will help your blog to increase your SEO traffic and Meta Tags will help to find the site info to search engines. Add this Meta Tag Code below <head> section of your blog. 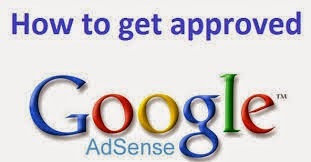 Your domain should be minimum 6 months older, then only Google Approve your Adsense request. If your content id unique and rich and you have good no. of visitors then you will get Adsense Account before 6 months. For better and SEO friendly blog and good adsense CTR, you should use Google's +1 Badge Widget. For a Good SEO and fast adsense account you should submit your blog to Google's Webmaster. Some include adding alt tags and robots.txt files. Your Blog Should have some pages which tells the policy of your site/blog like our website. Your content on your blog should not be copied. and, that should be self return. When you are going to submit your site to adsense, your site traffic might exceed a limit of 300.